Remember those relatively cool mornings felt last Wednesday, Thursday and Friday? They are gone as August steam and August rain chances dominate weather headlines for the new week. Today and Tonight: An upper level ridge is building to our south, but that will still bring moisture onshore and prime isolated pop-up afternoon storms. 30 percent of the area is expected to receive rain on Monday with the best chances along and west of the Mississippi River. Highs will reach near 92 degrees by mid-afternoon with overnight lows around 75 degrees. Up Next: The upper level ridge moving into the Gulf from Florida will help to hold deeper moisture west toward Texas. Surface high pressure will stay put over the Appalachians along the Tennessee/North Carolina border over the next few days and keep any incoming cold fronts away. 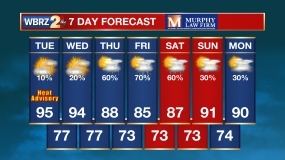 Continued onshore flow of moisture will mean that despite a warming atmosphere, isolated showers and storms can still pop up in daytime heat with highs reaching about 93 degrees on Tuesday and Wednesday. Nights will be quiet but muggy with lows in the mid 70s. This pattern will eventually break down and allow a trough to set up late in the week, bringing scattered showers and thunderstorms Thursday and Friday. 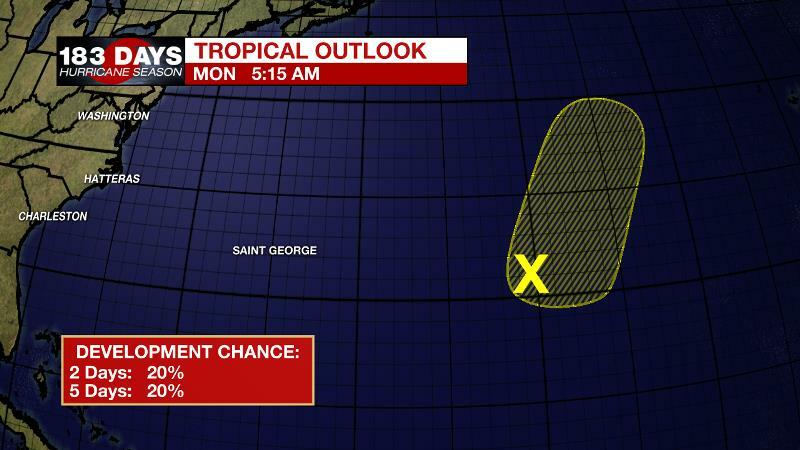 The Tropics: While the Gulf of Mexico and Caribbean Sea remain hot but quiet, a weak disturbance churning in the East Central Atlantic is being monitored by the National Hurricane Center. Not to worry though, this system has a fleeting chance for development at 20 percent and is no threat to the United States. The overall weather pattern continues to remain rather typical for this time of the year, with continued near-normal afternoon highs and isolated thunderstorms to follow. The Baton Rouge area remains on the southern edge of a split ridge across the southern US, helping with a steady easterly flow from the surface to the mid-levels. Interesting to note is a small upper-level low spinning in the weakness between these two upper ridge centers across northern Mississippi. The upper-low will slowly dive southeast Monday before making its way into the far northwest Gulf by tonight. Expect scattered convection to reside with better upper-dynamic support and deep-layer moisture generally west of I-55 and especially the Mississippi River. By Tuesday and Wednesday, the aforementioned upper-level low is expected to weaken. An isolated showers or thunderstorm will still be able to flare up but rain coverage will only be around 20 percent. By Thursday and into Friday, the surface high and weak upper-ridge will weaken and press east, as a deepening trough develops across the eastern US. This will lead to a series of disturbances riding the northwest to southeast flow aloft, and help increase showers and thunderstorms through late week and even into the weekend.